It’s almost a day that I’m trying to get things working in here. I’ve set-up a small home server (actually is my old HP laptop running ubuntu 10.04) with some server applications like apache, mysql-server and other stuff like php5, ruby, and RAILS. After that, it been a long road until now, with installs , remove , clean, installs of various combinations of ruby and rails versions…untile I finally decided to give up. After this last command I found that ubuntu installs all that you may need for rails, with only one command. ‘Finally!’ – I said! Let’s try this time if it works!! ‘Maybe there is a problem with WEBrick!’ – I thought, and I’ve installed another ‘web server’ for rails, called Mongrel, and used that to launch my first web app. 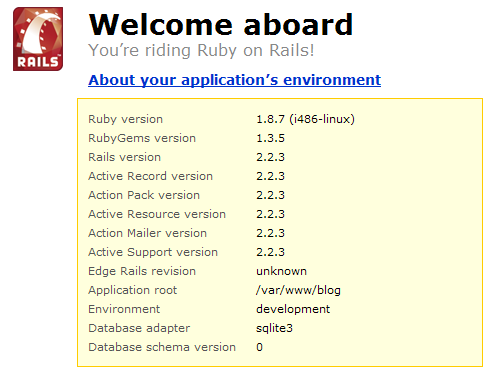 Let the journey with rails begin!